Here it is folks, the recipe for Halloween Nachos. Straight from the 6 year old test kitchen–tested ’til perfect without parental supervision. Caution: this might be what you get when you ask your 6 year old to make nachos for you. Grate cheese. 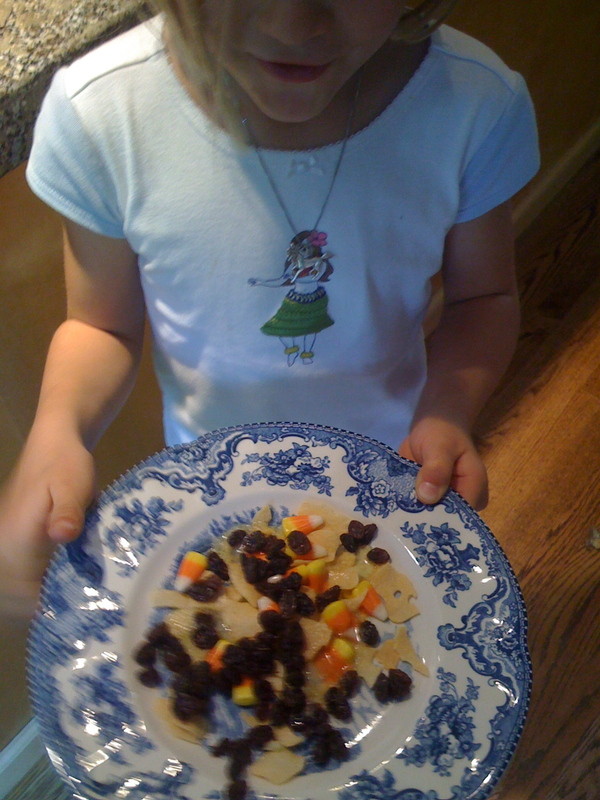 Layer chips, cheese, raisins and candy corn. Microwave until candy corn and cheese is melty or until you mom walks in and screeches for you to get your nose away from the microwave while it is microwaving. Serve to your dad to eat while watching college football. This entry was written by Mermaid and posted on October 27, 2008 at 12:05 pm and filed under Funny Things Kids Do, K3, Mermaid with tags 6 year olds, college football snacks, halloween nachos, K3, kids. Bookmark the permalink. Follow any comments here with the RSS feed for this post. Post a comment or leave a trackback: Trackback URL. He’s a good father, but not a crazy one. We have stopped even trying to fake that we like some of these creations. We are working on positive reinforcement on the yummier concoctions. We draw the line at cereal with chocolate syrup, chocolate chips and orange juice instead of milk!